Beloved and I went to Omakase today. Yes, again. The reason basically was we were craving for their rolls. Also, ever since we ate there, the only thought in mind was we had to go back here. So we did. When we got there, the place was full, and there was a waiting queue for those wanting to eat there. Even then, we still waited just to eat there. This just shows how good the place is. As expected, we ordered their rolls. This time, we ordered a platter of three: the GDR Platter (575 Php). 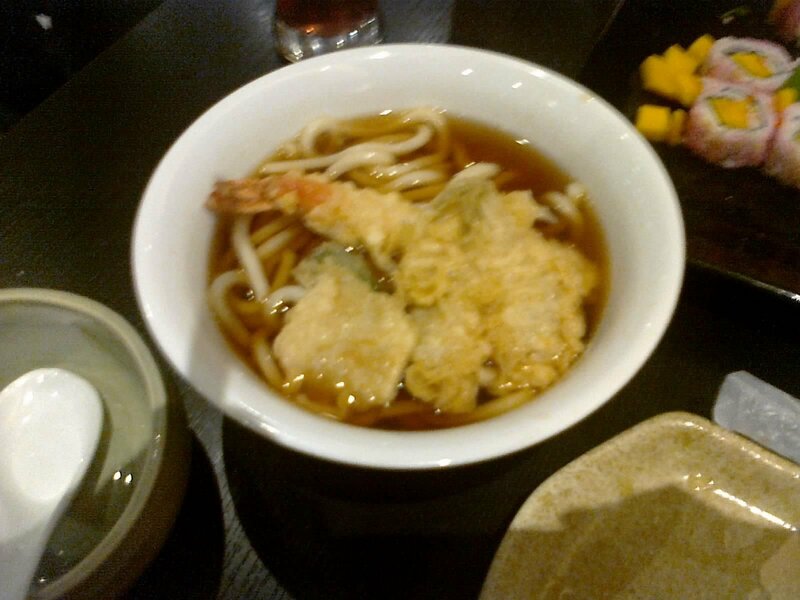 Beloved didn’t have anything to eat yet for the day, so she ordered Tempura Udon (230 Php) for herself. 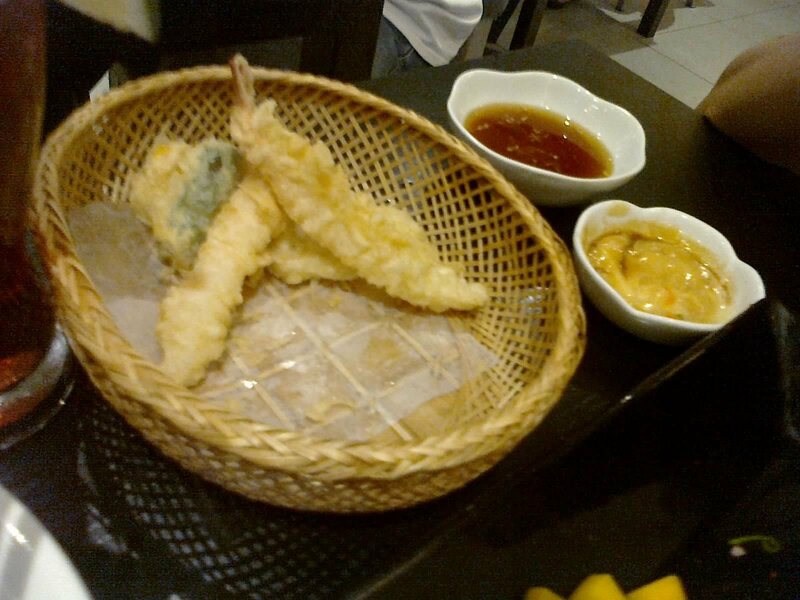 As for me, I also ordered 3 pieces of their Ebi Tempura (160 Php) since, if you’ve read my last review, I’ve wanted to taste their tempura after tasting their batter. We also ordered iced teas (55 each), and asked for their hot tea. Unfortunately, the hot tea didn’t come, maybe because it was a full house and they prioritized larger tables. Anyway, the platter came first. GDR basically stood for its contents: Golden sun, Dynamite, and Rising sun rolls. The sauce included was the same as last time: their own mayonnaise with teriyaki sauce topped with sesame. The Rising sun roll, the one at the back, was the one we ordered the last time we went, and it’s still divinely delicious, even though they traded their avocado with mangoes, apparently they were out of it as well. 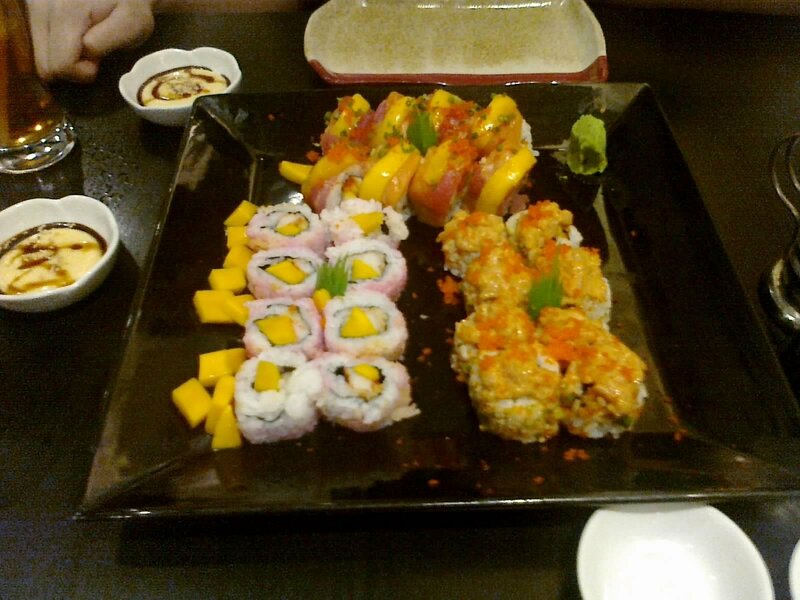 The mangoes rendered the roll a bit sweeter than the last time, but it’s still a wonderful treat. The Dynamite roll is the orange one topped with something on the right. The something was supposed to be spicy scallops, but they were out of it so they replaced it with salmon. Inside of the roll was unagi (eel) tempura. The bite was unusual, as it had the slightly spicy topping with a smoky, crunchy interior. But this strange medley of tastes and texture also works, especially with the deliciously sweet sauce. The Golden sun is the pink one with yellow inside. 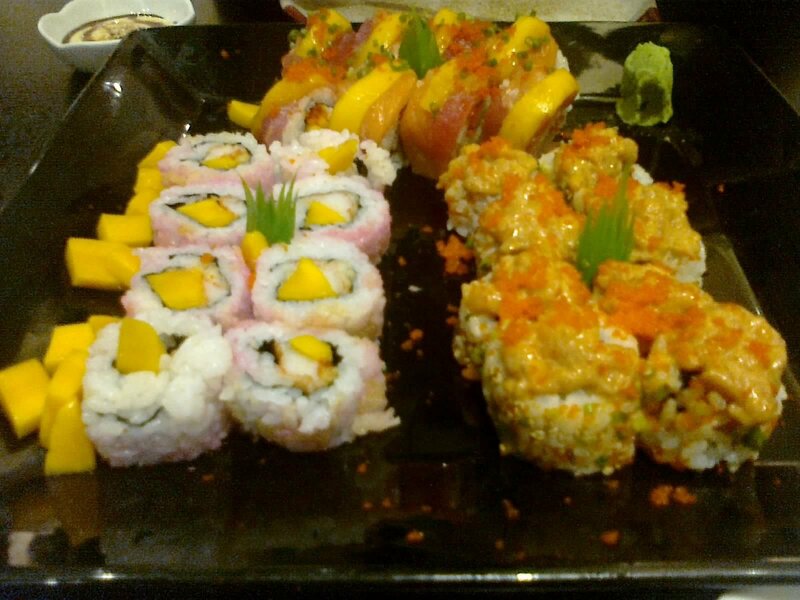 It had mangoes and kani (crab) inside the roll and crunchy tempura batter on the exterior. This made the roll have a crunchy bite to a soft, sweet core. I found the the texture surprisingly pleasant for a seemingly simple roll. I actually didn’t realize the crunchy stuff on the outside at first, and it didn’t seem visible, and didn’t look crunchy at all. I find it similar to the classic California maki, except the outside is a delicious crunchy crust. Beloved’s udon was simple. It didn’t have any extraneous ingredients other than the tempura, broth, and noodles. The tempura did have variety, however. It had fish, shrimp, and vegetable tempura. They were okay, and the batter didn’t have its crunchy texture anymore since it was submerged in the hot broth. The broth had a mild soy taste, slightly sweet and entirely soothing. All in all, it was a simple bowl at its best. The tempura came last. I only ordered three pieces, and I already ate one when we realized we haven’t took a photo of it yet. It was less crunchier than we would’ve liked it. Apparently, they used the crunchy batter to complement their rolls. It was also smaller than the one on Tempura Japanese Grill. It was quite meaty, although it tasted a bit too plain. The good thing is, there were also some vegetable tempura added—sweet potatoes and okra. The second trip here confirms that their specialty really is their maki. The simplicity of the other stuff on their menu is contrasted by their complex sushi rolls. I still find the Rising sun far better than the other two rolls. However, the other two rolls were good and special in their own way. The best thing about their rolls is their texture. The taste you can adjust with their delicious sweet sauce, or by making your own salty and/or spicy one with the wasabi and kikkoman provided. Our bill amounted to more than a thousand today. However, I still find Omakase worth it for their unique and delicious rolls. Recommended for: Maki sushi lovers. Not recommended for: Ramen cravers; restaurant queue haters. Smart nomnomnom tip: Call for reservations if you’re in a huge party: (+632) 332-4115.